Season of the year. The four teḳufot are: (1) Teḳufat Nisan, the vernal equinox (March 21), when the sun enters Aries; this is the beginning of spring, or "'et hazera'" (seed-time), when day and night are equal; (2) Teḳufat Tammuz, the summer solstice (June 21), when the sun enters Cancer; this is the summer season, or "'et ha-ḳaẓir" (harvest-time), when the day is the longest in the year; (3) Teḳufat Tishri, the autumnal equinox (Sept. 23), when the sun enters Libra, and autumn, or "'et ha-haẓir" (vintage-time), begins, and when the day again equals the night; (4) Teḳufat Ṭebet, the winter solstice (Dec. 22), when the sun enters Capricornus; this is the beginning ofwinter, or "'et ha-ḥoref"(stripping-time), when the night is the longest during the year. Each teḳufah, according to Samuel Yarḥinai, marks the beginning of a period of 91 days and 7½ hours. An ancient and widely believed superstition is connected with the teḳufot. All water that may be in the house or stored away in vessels in the first hour of the teḳufah is thrown away in the belief that the water is then poisoned, and if drunk would cause swelling of the body, sickness, and sometimes death. Several reasons are advanced for this. Some say it is because the angels who protect the water change guard at the teḳufah and leave it unwatched for a short time. Others say that Cancer fights with Libra and drops blood into the water. Another authority accounts for the drops of blood in the water at Teḳufat Nisan by pointing out that the waters in Egypt turned to blood at that particular moment. At Teḳufat Tammuz, Moses smote the rock and caused drops of blood to flow from it. At Teḳufat Tishri the knife which Abraham held to slay Isaac dropped blood. 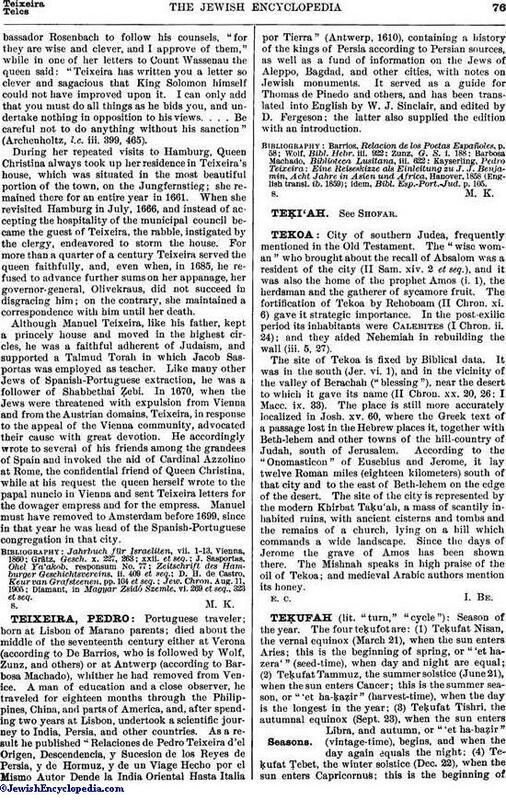 At Teḳufat Ṭebet, Jephthah sacrificed his daughter (Abudarham, "Sha'ar ha-Teḳufot," p. 122a, Venice, 1566). The origin of the superstition can not be traced. Hai Gaon, in the tenth century, in reply to a question as to the prevalence of this custom in the "West" (i.e., west of Babylon), said it was followed only in order that the new season might be begun with a supply of fresh, sweet water. Ibn Ezra ridicules the fear that the teḳufah water will cause swelling, and ascribes the belief to the "gossip of old women" (ib.). Hezekiah da Silva, however, warns his coreligionists to pay no attention to Ibn Ezra's remarks, asserting that in his own times many persons who drank water when the teḳufah occurred fell ill and died in consequence. Da Silva says the principal danger lies in the first teḳufah (Nisan); and a special announcement of its occurrence was made by the beadle of the congregation ("Peri Ḥadash," on Oraḥ Ḥayyim, 428, end). The danger lurks only in unused water, not in water that has been boiled or used in salting or pickling. 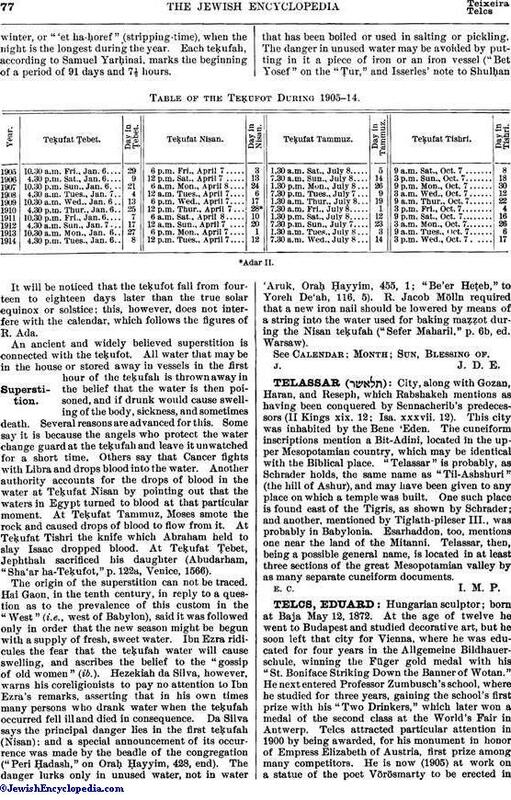 The danger in unused water may be avoided by putting in it a piece of iron or an iron vessel ("Bet Yosef" on the "Ṭur," and Isserles' note to Shulḥan 'Aruk, Oraḥ Ḥayyim, 455, 1; "Be'er Heṭeb," to Yoreh De'ah, 116, 5). R. Jacob Mölln required that a new iron nail should be lowered by means of a string into the water used for baking maẓẓot during the Nisan teḳufah ("Sefer Maharil," p. 6b, ed. Warsaw). Table of the Teḳufot During 1905-14. See Calendar; Month; Sun, Blessing of.